Hypothyroidism Veg Diet for Diabetes, Thyroid disease and diabetes diet, Indian Recipes. You must often have noticed that if you have been detected with thyroid disorder the next screening done by the doctor is to check blood sugar levels and vice versa, if you have been diagnosed with high sugar levels (condition termed as diabetes) you will also be advised to test for thyroid disorders. This is because both the conditions are hormone related. Thyroid disorders are associated with thyroid hormones – T3, T4 and TSH (Thyroid Stimulating Hormone) released by the thyroid gland and diabetes is closely associated with insulin released by the pancreas. These hormones interplay in our body. So it is not uncommon for people to have thyroid disorder and diabetes both. If you have been detected with any one disorder screening for other is a must so that timely treatment can be provided by the expert doctors in the field. So how deeply are Hypothyroidism Diet and Diabetes connected? Since one of the major function of thyroid is to control metabolism, its disruption that interferes with metabolic activities can alter the blood sugar levels and lead to the onset of diabetes. On the other hand, hormones like thyroid and insulin work hand-in-hand to control metabolism and blood glucose. If the thyroid hormone decreases, as in case of hypothyroid, then the levels of insulin may increase to balance off and this may sometimes increase the risk of hypoglycemia (low blood sugar levels). Thus it is very crucial to closely monitor the condition and adjust the medications for thyroid and diabetes. Well, this will be taken care by your endocrinologist. What you can do for yourself is lifestyle and diet changes so you can get a better control over this condition. It is also said that if hypothyroid is well controlled with medication and diet, diabetes can be under check. Know the complete list of foods allowed and avoided for hypothyroid and foods for Diabetes in detail. Basically a diet rich in nutrients and antioxidants is the elemental key for those with diabetes and hypothyroidism. To summarize it below are 15 pointers for you to follow closely to achieve controlled levels of both thyroid hormones and blood glucose. 1. The most important is to not skip any medication or alter its timing and /or dosage. Remember any minor change in medication causes further disruption in hormone level. 2. Since low metabolism also leads to weight gain, avoid high carb and high GI (glycemic index) foods like potatoes, sweet potatoes, yam, purple yam, mango, banana, chickoo and custard apple. 3. Certain foods though rich in antioxidants are not in favour of thyroid hormone. Avoid cruciferous vegetable like broccoli, cauliflower, cabbage, Brussel sprouts, kale and spinach. Rely on other vegetables like mushrooms, capsicum, ladies finger etc. instead to make up for your nutrient requirement and prevent other deficiencies. Roasted Mushroom and Capsicum is one such quick to make subzi. 4. Go easy with soy and its products. They hinder thyroid hormone production. 5. Include protein, zinc, selenium and iodine by way of dals, pulses, sprouts and iodized salt. Protein from recipes like Suva Masoor Dal and Sprouted Matki and Coriander Uttapa has a delayed effect on gastric emptying thus avoiding blood sugar spikes. 6. Avoid wheat and its products like broken wheat, semolina, plain flour along with barley and rye if you have gluten intolerance. Going gluten-free in general can help thyroid levels stabilize too, though it is quite individualistic. Avoid other plain flour (maida) based products like bread, burger, pizza and all types of cookies and biscuits as they tend to be absorbed very quickly and lead to a rapid rise in blood sugar levels. 7. Prefer low fat dairy products over high fat dairy products. 8. Rely on grains like buckwheat, quinoa and oats. They are the best whole grains for your body. Try Buckwheat Pancakes and Oats Idli. They are truly a treat for the taste buds. 9. Dodge away the coffee and alcohol routine if any. They enter your blood stream directly giving a big rush of sugar in the blood and further disrupting the hormone levels. 10. Sugary items and fried foods are indisputably to not feature on the menu. Learn the art of cooking healthy diabetic snacks. 11. Include MUFA (mono unsaturated fatty acids) by way of avocado and olive oil. They help stabilize blood sugar levels. 12. No packaged and ready-to-eat foods also please. 13. Fresh and dried herbs are your best friends to flavour foods. 14. Watch your portion size of course. Too much food at a go is definitely not advisable since hypothyroid is commonly associated with weight gain and diabetes both. Avoid that fluctuations in blood sugar levels by restricting the serving size. One other way to have a feeling of satiety is to serve food in small plate and chew your food very well. 15. Drink enough water. At least 10 to 12 glasses of water. Right amount of water is imperative to ward off toxins from body and boost metabolism. Treat your glands with best foods and they will pay off by assuring your good health. 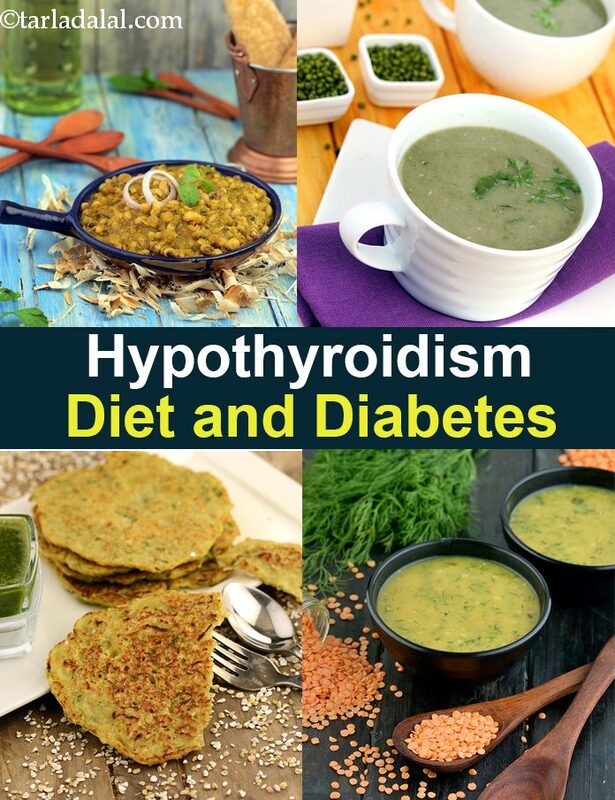 Enjoy our Hypothyroidism Veg Diet for Diabetes, Thyroid disease and diabetes diet, Indian Recipes and other Hypothyroidism and Hyperthyroidism recipe articles below.